HIS has applied the "HD" concept design on its new models. Features include: high-quality gold-plated ports, black panel plate which sync. with the "High-definition" concept of the new RadeonTM HD Series. Advance to the next generation of gaming with incredible performance, life-like graphics and support for the latest Microsoft® DirectX® 10.1. With 320 stream processors and PCI Express® 2.0 support, you're ready for the most demanding titles. And thanks to plug-and-play ATI CrossFireXTM upgradeability, it is easy to turbo-charge your 3D performance. ATI RadeonTM HD 3800 Series GPUs feature ATI AvivoTM HD technology with advanced audio, video processing, display and connectivity capabilities for high definition entertainment solutions. ATI AvivoTM HD technology includes fully integrated HD audio capabilities and supports playback of multi-channel (5.1) audio streams. When combined with the integrated HDCP copy protection, ATI Avivo HD enables a one-cable HDMITM connectivity solution to high definition home theaters. The ATI RadeonTM HD 3800 Series GPU further enhances the HD entertainment experience by making it easy to make the connection to a big- screen or home theater system. With built-in 5.1 surround audio (AC3) pass-through capabilities, the new GPUs and graphics cards support a single HDMI connection direct to a compatible TV or receiver. This single cable carries both the HD video and 5.1 surround audio for a clean, high definition connection. Some graphics cards will have an HDMI connector built in, while others will use a special ATI Radeon DVI-I to HDMI adapter. These options mean greater choice and flexibility for consumers when connecting to PC monitors or home theaters for maximum enjoyment of full HD 1080p content. ATI RadeonTM HD 3800 series GPUs offer full support for the new DirectX® 10 and DirectX 10.1 API (Application Program Interface) from Microsoft®; ready to meet the demanding needs of new, next generation games. DirectX® 10 is the first totally new DirectX® in the last 4 years and brings important graphics innovations that can be used by game developers for the next generation of games. DirectX® 10 introduces crisp, never-before-seen detail-rich images, visual effects and game dynamics capable of accurately simulating the real world. No matter which ATI RadeonTM HD 3800 Series GPU you choose, you can be assured that games will look as good as the developer intended! ATI RadeonTM HD 3800 series GPUs provide total support for the Microsoft® Windows Vista® operating system and improve the performance of the Windows AeroTM graphical interface. You will be amazed by the dazzling 3D visual effects and have peace of mind that the ATI CatalystTM software and drivers are designed and thoroughly tested to ensure full compatibility and stability to keep you up and running. All these new technologies and features make the ATI RadeonTM HD 3800 series of GPUs the ideal solution for ultimate HD gaming and HD video entertainment with the Windows Vista OS.
" 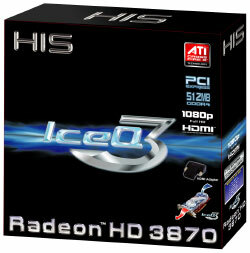 PC World Komputer Top Ten "
" The HIS 3870 IceQ3 512 MB is a very solid offering on the HD 3870 market. It comes with the special IceQ3 cooler and runs at clocks that are among the highest available. " " We overclocked the already-overclocked card from 850MHz to 900MHz and although the temperature did rise slightly, the whole system was still very stable. " 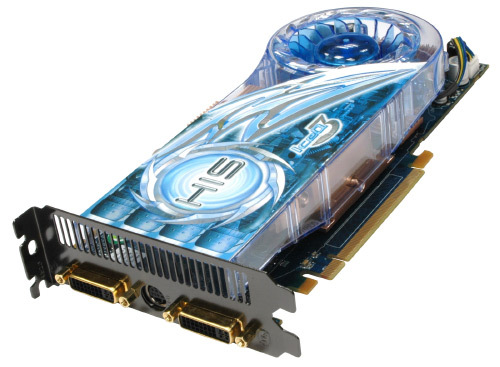 " HIS IceQ III RADEON HD 3870 Turbo 512MB PCI-E is actually the best 3870 card of all. "